Maybe he is the leader of the offense, but not the team. I have to believe guys like KW, MH and Lorax are still the player leaders. Gotta win a few more games and establish yourself more in the locker room. Good leaders lead by example and earn it through respect. He's not there yet, but he's off to a good start. I still think LeSean is the offensive leader. But I will give you Allen is the heir... right now. He needs to lead this team to victory a few times in order to be the unquestioned. I said this from the time he became the starter. You can see this team has a completely different feel and energy when he is in there. Their best game was with Matt Barkley. If Allen keeps improving, he will get there. The worst team we played all year was the Jets who on that day didn't have their heads in the game from the very 1st play through the end. 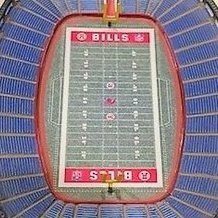 If the Jets are as listless in Orchard Park as they were in NJ, Barkley will end up playing in the 4th quarter with the Bills up by 40 and Allen resting on the sidelines to protect him from cheap shots late. as for allen has become the leader. I'd have to say he is paving the way to becoming the leader, it takes time to earn that level of respect from both the team and coaches. he's starting to make a believer out of me. I thought even in a loss the miami game was the best game by any of the 4 QB's so far this season. even though he threw for one more yd (232 to allens 231) and no int's, I liked allens game in miami much more than barkleys at metlife stadium. not knocking barkley by any means, he played a good game but he is no josh allen. that's what has lifted the excitement level for me, watching this raw rookie, who plays his heart out, go out there and compete on sundays. Then you didn't see Baker Mayfield destroy Cicny the week before. Allen is showing signs, but right now Mayfield is the more polished QB. And so you don't think I'm a Mayfield fanboy, the Texans D made him look as bad as Allen did when they met last week. PS I'm assuming you're talkiing about the 4 QBs drafted this year, not the 4 QBs the Bills have started, because I think it's safe to say Peterman was not a QB. He is the leader of the offense. He is the show. I'm not sure that there's an official title for Leader of the Team...but if there is, I'd let the players do the crowning. I was not. I was referring to the bills stable. I feel Ray Ray is more the top leader of this team. LMAO.. Make sure you use some scope when your done. Im excited. Looks like we finally found a legit QB threat... Keep JA healthy and coach him up this offseason. Surround him with solid protection and weapons and we are looking good. Exciting times at OBD! Most of the time it takes years to become a leader, but in Allen’s case I see your argument. He’s young, but youth doesn’t automatically disqualify you. Typically small acts of leadership build up your cred. Allen can prove a lot over the next 4 weeks. Does he continue playing all out and giving up his body to get extra yards by finishing his runs & hanging in the pocket? If he mails in the next 4 weeks and regresses his leadership cred will be brought into question. Especially with the amount of youth around him on the offense. I think the team is behind him 100%, but he is going to have to prove he can do a little more with his passing game (finding open guys, hitting more receivers in stride, etc.) to be the full-blown leader of the offense. The offense rallies around him. Rookie or not.. they're so bad he looks like a godsend to them. Makes them all look way better than they have any business looking and that'll win respect.